Enhance your summer block parties by Tree Tagging, a fun and educational group/family activity. Make a list of all the trees on your block with species and diameter. If an inventory is not available already, then search online to identify each tree, or get “Fandex Family Field Guides: Trees.” Diameter should be measured 4.5 feet above the ground. The website treebenefits.com will help you quantify the value of each tree on your block. This is the National Tree Benefits Calculator, which you can access via your smart phone. Yes, there is a dollar value to each tree. But the most interesting information you will find is regarding the enormous environmental impact of trees. For example, I entered some typical data into the Tree Benefits Calculator. A medium-sized Silver Maple with a 20-inch diameter will give a family $176 worth of benefits each year, increasing their property value by $52 a year. To be honest, this may not seem like much, until you take a look at the environmental impact. Stormwater InterceptionThis same maple tree will intercept 2,665 gallons of storm water each year, not only through its root system, but also via its leaves, branches and bark. The tree’s structure will also reduce soil erosion. Stormwater runoff is a major problem in urban areas due to an overabundance of impermeable concrete, asphalt, and roofs. Trees counteract this negative effect. Energy Conservation A 20-inch Silver Maple will conserve 126-kilowatt hours of electricity for cooling and reduce consumption of oil or natural gas by 48 therms. According to the Tree Benefits Calculator, trees conserve building energy use in three ways: 1) Shading reduces the amount of heat absorbed and stored by buildings in summer. 2) Transpiration by trees cools the air in summer. 3) Trees slow down wind, thus reducing heat loss from homes in winter. Carbon Sequester A 20-inch Silver Maple will reduce atmospheric carbon by 645 pounds. This CO2 is “locked up” in the roots, trunk, stems and leaves of the tree. Let’s not forget that our urban forest reduces air pollution. Leaves absorb not only carbon dioxide, but also ozone, nitrogen oxide, sulfur dioxide. And of course these lovely green filters release oxygen in a crucial partnership with human life. 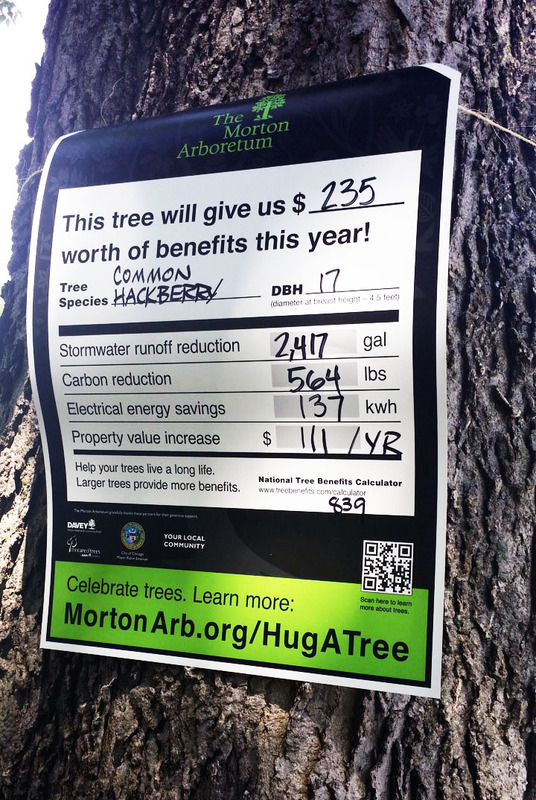 Tree Tagging Supplies To get started, gather these supplies: tree identification guide, measuring tape, smart phone to access Tree Benefits Calculator, tree tags from Morton Arboretum (or make your own), markers, hole punch, and string. And enjoy! Special thanks to Mary Chris Jaklevic who created this Tree Tagging How To sheet, an invaluable resource for this article and for this activity. Photo by Kris DaPra from Cook County Forest Preserves.